‘Suitable Work’ redefinition: After four weeks of receiving unemployment benefits, recipients must accept a job offer that is 120 percent of the Unemployment Insurance (UI) Benefit Amount (minimum wage) or lose benefits. Work training program introduced that both prospective employers with job opportunities and unemployed workers can voluntarily engage in. Unemployed workers would be excused from job search activities and receive UI benefits while undergoing training. Issue: The suitable work redefinition in #1 is highly problematic. It is not the same as the provision in North Carolina that it is supposedly modeled after. The Arizona Department of Economic Security (DES) already uses an 80 percent of prior wage standard when evaluating suitable work, so provision #1 is unnecessary (committee hearings failed to bring either of these facts out). Recommendation: Floor amendment that rescinds the suitable work redefinition provision from the bill. 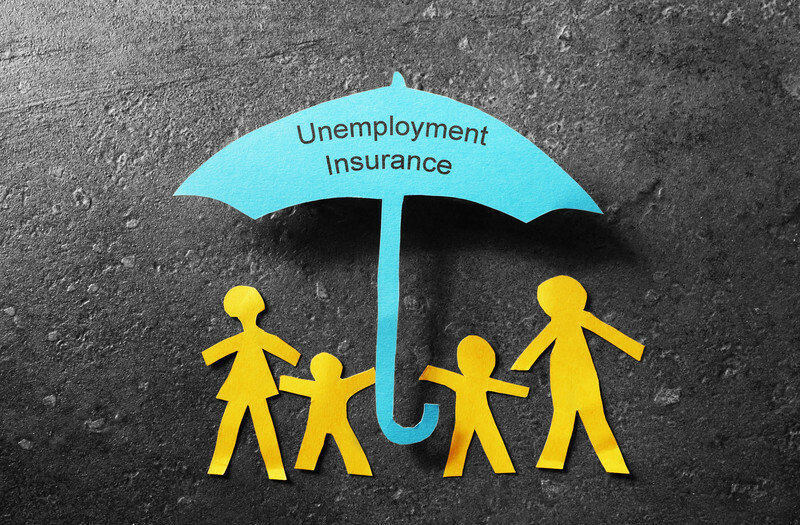 Background: What is Unemployment Insurance? To be eligible for unemployment insurance benefits a person needs to lose a job through no fault of their own. Generally, if a person is fired or quits a job they are not eligible for benefits. UI is a program that eligible workers earn and is designed to provide some level of income support during the emotional and economic distress that accompanies job loss. Current law requires DES to consider prior wages earned, the distance traveled to the job, and working conditions in determining whether or not suitable employment has been turned down. SB1398 Provision: Force workers to lose benefits if, after four weeks, they do not accept a job that pays minimum wage regardless of extenuating circumstances (minimum wages in almost all cases is greater than 120 percent of the benefit being received). Problem: There are many reasons why a worker ought to be able to turn down a job. Current law requires UI recipients to engage in documented job search activities at least four days per week. Job search should be a two-way process by which the applicant and the prospective employer ascertain whether they are a match. DES is already empowered to terminate benefits if a person turns down an offer the agency deems suitable. DES already has sufficient guidelines for determining suitable work in statute. DES considers: 1) the degree of risk to the individual’s health, safety and morals; 2) the individual’s physical fitness and prior training; 3) the individual’s experience and prior earnings; 4) the individual’s length of unemployment and prospects for securing local work in the individual’s customary occupation; and 5) the distance of the available work from the individual’s residence (R.S. § 23-776). The general standard used on prior earnings is already 80%, which is more appropriate than a standard based on UI Benefits which are only designed to replace half (or less) or prior wages. As noted in #2 and consistent with #1, the evaluation of a job prospect should NEVER be limited to only the wages paid. For instance, if the distance and/or hours offered conflict with the worker’s ability to get there and maintain other family responsibilities, including care of children. Pay is not always communicated clearly in job ads or presented as a range based on experience. Not until the job is offered might an applicant know whether or not the pay is sufficient compared to prior pay levels the unemployed worker had received and has a reasonable expectation of receiving in his or her job search. Likewise, sometimes the position offered is not the one applied for, but one with less pay or worse working conditions. Four weeks is TOO SOON to be forcing mandates that exclusively focus on pay rates. The bill’s sponsor has made a point of emphasizing how this bill is modeled after North Carolina. In North Carolina, the 120 percent of unemployment benefit standard does not apply until after TEN weeks, not FOUR weeks. It may take four weeks simply to get your first interview. For a worker’s career progression, accepting work that adversely impacts their pay could have long-term consequences that lead to a prolonged period of lower pay—which also increases the likelihood the family will need to rely on other government programs like SNAP. Fact: No evidence for Arizona taxing too much on unemployment insurance. 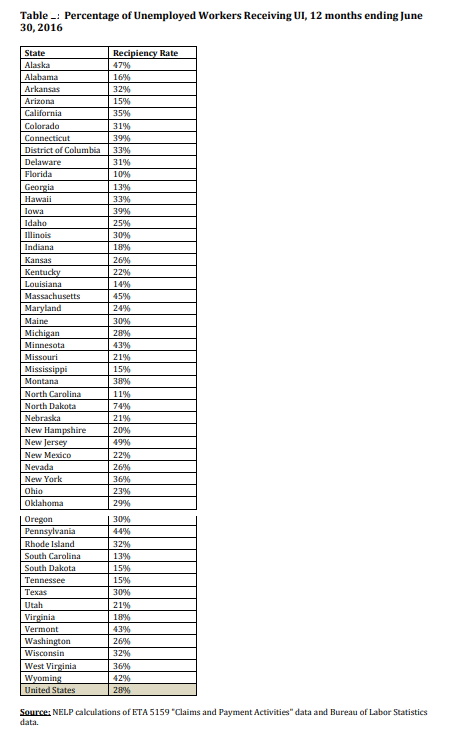 Arizona’s unemployment insurance tax is three-fourths of the national average. Unemployment insurance is paid through a tax on employers, though economists consider it part of the total wage bill, so it is wholly or partially paid for through lower wages paid to the employee. In Arizona the tax is assessed on the first $7,000 of earnings, the minimum allowed by federal law. In most other states, the tax is assessed on the first $15,000 or more (the highest is $44,000). As a percent of total wages, Arizona’s unemployment insurance tax rate was 0.43 percent (43 cents out of each $100 paid in total wages and salary). The national average is 0.59 percent. (Source: U.S. Dept. of Labor, Employment & Training Administration, Average Employer Contribution by State, 2017 (est).) Click here for more information. Fact: Arizona does not have cost problem with its unemployment insurance system. Arizona’s maximum unemployment benefits are the second lowest in the country-and far lower than all neighboring states. 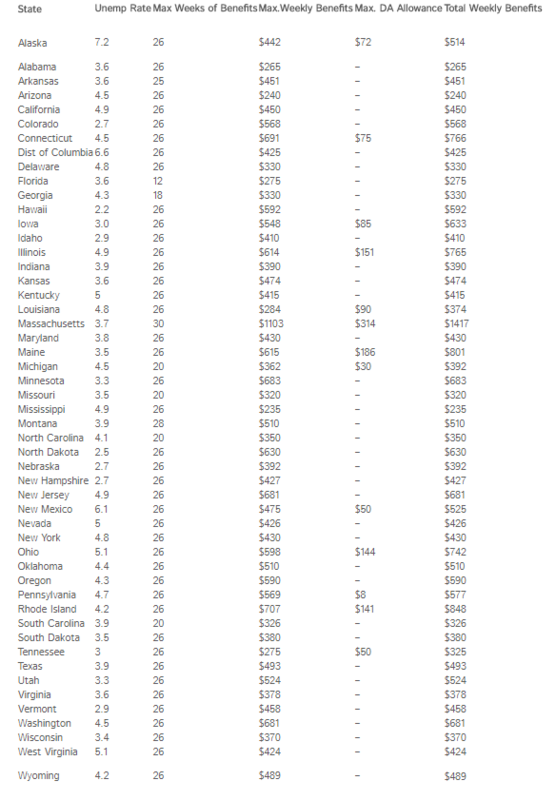 Arizona’s maximum weekly benefit of $240 is about half of nearby states: Nevada ($426), Colorado ($568), Utah ($524), New Mexico ($475) and Texas ($493). In addition, Arizona has far fewer workers receiving unemployment benefits as a percent of the total unemployed population compared to almost all other states. Only 15 percent of unemployed workers in Arizona collect benefit, which is much less than Nevada (26 percent), Colorado (31 percent ), Utah (21 percent ), New Mexico (22 percent ) and Texas (30 percent ). Arizona’s benefit formula is similar to many other states, but capped at a far lower rate. Benefits are designed to replace HALF of prior wage levels. Consequently, a recipient whose benefits are not capped could be expected take a position that PAID FORTY PERCENT LESS than their prior work under the suitable work provision in this bill. The lack of clarity involved in some job pay ranges could lead an unemployed individual to inadvertently seek a position that pays substantially less than their previous position. Arizona’s maximum benefit is $240 per week. Workers who had earned more than $480 per week ($25,000 per year) will have their benefits capped, so they will receive less than half their prior pay. For example, a person who was earning $35,000 per year would receive just over one-third of their former pay as unemployment benefits. DES reports that the average weekly benefit amount is $230 which indicates that a very large portion of recipients’ benefits are capped at $240 per week. Consequently, unemployment benefits are not a good measure for determining suitable work. Prior earnings are far more appropriate. The current use by DES of 80 percent of prior earnings is a better standard (reported on Gilger, Lauren, KJZZ, “What does Arizona Law Require of People on Unemployment,” March 23, 2018. Click here for source. Fact: While North Carolina did apply a suitable work standard tied to unemployment benefits the state’s maximum benefit is much higher, $350 per week, so the legal threshold for someone capped is at least $420 per week. And it does not apply until after 10 weeks, not 4 weeks as with SB1398. New definition of suitable work: After the tenth week of the benefit period, any employment offering 120 percent of the individual’s weekly benefit amount will be considered suitable work. (N.C. Gen. Stat. § 96-14.9.) This means that part-time work may be deemed suitable work if it meets the requirements set out in N.C. Gen. Stat. § 96-14.9 (Source: Adams, Julie K. and Jade C. Murray, “United States: Sweeping Changes to North Carolina’s Insurance Laws Take Effect on July 1, 2013,” mondaq.com, July 9, 2013. Click here for source. Source: FileUnemployment.org, “Unemployment Benefits Comparison by State.” https://fileunemployment.org/unemployment-benefits-comparison-by-state. Access table at Testimony of Judith M. Conti, National Employment Law Project, “Unemployment Insurance: An Overview of the Challenges and Strengths of Today’s System, “ Hearing before the United States Congress, Human Resources Subcommittee, House of Representatives Ways and Means Committee, Sept. 7, 2016, pp. 13-14, http://www.nelp.org/content/uploads/Testimony-Unemployment-Insurance-Overview-Challenges-Strengths.pdf.